A LOT happened while I was away. The EPO was trying pretty hard to distract from an eventful scandal, having issued 3-4 ‘news’ items in just a couple of days (it typically posts only 1 or 2 per week, sometimes 0 for a whole month). On Thursday and Friday it kept ‘banging’ on with lots about the latest nonsensical ‘study’ (passing money to the German media), as well as #IPforSMEs. Nothing was said about the meeting in Munich (Wednesday until Thursday), except the obvious distractions/face-saving tweets we’ll come to in a moment. 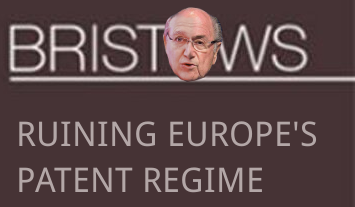 On Thursday Battistelli’s latest photo op was released (warning: epo.org link). It can be found via this tweet too. ISO is corrupt enough that it can afford a handshake with Battistelli (one can bribe for or ‘buy’ standards at ISO, as we showed a decade ago). Battistelli also shared a new photo op of him (warning: epo.org link) signing papers with a country that facilitates his abuses, more specifically INPI which looks as though it engaged in entryism against the EPO (just look at members of staff at the top-level management). Does that say where Battistelli came from and brought much of his management team from? That in itself is a scandal and they put this photo op in INPI’s Twitter account too, only to then (very soon) get retweeted by the EPO. It’s like an “evidence of the crime” photo op, but Battistelli got too accustomed to being above the law. He just doesn’t care. Then came another “news” item, this one with Christoph Ernst, who is complicit by inaction. This latest one (warning: epo.org link) is quite revealing. (promoted with the photo op in Twitter). He’s taking photo ops with Lutz just to metaphorically spit on the graves of victims at the Boards of Appeal. Perhaps he fails to realise just how bad that makes him look. The EPO had said nothing about the Boards of Appeal other than this tweet which states: “The application deadline for the 2018 judicial internships at the Boards of Appeal session is 9 January” (internships are not jobs and the Boards are massively understaffed). On 13 and 14 December the Administrative Council of the EPO meets in Munich. The agenda can be found in micado as CA/105/17. 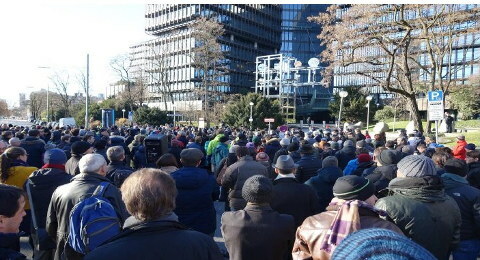 SUEPO Munich called for a demonstration in front of the Isar building on the first day of the meeting of the Administrative Council. The aim of the demonstration was to signal to the Council that their governance is needed. While Mr Battistelli still pretends that “all is well” and tells the Council that he is making good progress with the social dialog, some 700 colleagues provided living proof of the contrary – see below. Mr Ernst, the new chairman of the Administrative Council had been invited to meet the staff in front of the building to see (and hear) for himself what the real situation is. Mr Ernst did not accept the invitation. He apparently preferred to rely on Mr Battistelli’s “alternative facts”. In those Judgments the Tribunal the EPO was ordered to reinstate the Member of the Boards of Appeal, lift the house ban imposed upon him, return any EPO property seized before and unblock his UserID with immediate effect. Mr Josefsson, President of the Boards, has given him access to the Haar building, but he is still denied access to the other Office buildings. Moreover: contrary to the Tribunal’s orders he has not been provided with a computer or a telephone. Under the circumstances he is still de facto suspended. With this Mr Battistelli and the Administrative Council once again show a total and utter lack of respect not only for his staff and their rights (“due process”) but also for the Tribunal and the Rule of Law. SUEPO will continue to denounce such behaviour and organise actions as long as necessary to bring respect for the Rule of Law back to the Office. As we expected all along, Ernst is akin to his predecessor, “his master’s voice.” The Council has a serious stain; there are many career climbers like Ernst, speaking nonsense (e.g. about patent quality) and knowingly spreading lies about the situation. They probably even lie to themselves about it. One answer of sorts has come with the leak of the Administrative Council’s agenda for its meeting this Wednesday and Thursday. Discussion of Corcoran’s tribunals have been given a confidential status, meaning that only government and EPO management representatives can be present, with no staff or observers allowed. In addition, a last-minute revised version of the agenda demonstrates that three documents produced for discussion and decision on the Corcoran case have been changed or replaced just hours before the meeting was due to start. Initially, the issue was due to be discussed with references to three documents numbered 16, 17 and 19. On Tuesday, those documents had vanished and were replaced in a revised agenda with documents 21, 22 and 24. We do not know what is contained in either set of documents, nor have they been provided to Corcoran: their subject. EPO insiders say that such a last-minute change is almost certainly the result of revisions from EPO management, and that if that’s the case, the changes would have been approved personally by Battistelli. Or, in other words, having been publicly criticized for personally involving himself in a dispute in which he had a clear conflict of interests, the EPO president’s response was to personally direct the proposal put in front of the Administrative Council for approval, despite the EPO officially claiming to have left the issue entirely up to the council. Such behind-the-scenes manipulation of the EPO’s processes and procedures is commonplace at the organization, staff complains, and stems from a culture of secrecy and lack of accountability that goes unchallenged (and is sometimes fed) by the representatives of European government on the Administrative Council. Indeed, it was the council’s willingness to accept EPO management’s proposals without question that led to it being criticized by the ILO for failing to consider the obvious conflict of interest in Battistelli involving himself in the Corcoran case. Corcoran’s case is not the only one. Battistelli and his management team have targeted a number of EPO staff, particularly union leaders, to the extent that they have repeatedly broken German and Dutch law (and then claimed immunity), distorted the organizational appeals process (and had two years’ of appeals thrown out), and even undermined the EPO’s Boards of Appeal to the extent that it forms a key part of an argument in front of the German constitutional court for stopping the introduction of a European Unitary Patent Court. Someone comes along and just does exactly what they want and no-one stops them. Blair, Campbell, Putin, Blatter, etc, etc. Its strange how this chap seems to have immunity from real criticism and heads up a fairly important organisation. Are these the sorts of people the EPO wishes to be associated with? In DG1, i.e. under the direct authority of Battistelli. The bets are open: how long before Battistelli will find an excuse – any excuse, to fire him? I don’t give him more than 6 months. Yes, we don’t expect that to last long. This, perhaps, was part of the plan (even if contingency). that may wll be, but then the internal decision if the accusations are right have not been finalised yet, therefore this was not a decision he could appeal at ATILO yet. Therefore ATILO could not decide on substance. Furthermore, ATILO only very rarely checks these kind of matters. They are an administrative tribunal, and therefore preferably only check whether the rules have been followed. This time they even avoided deciding whether the rules are legal or have benn legally correctly createf…. They found this decision sufficient to get the case off their table, without looking at the remaining elements of the appeal. I thought that the principle of “innocent until proven guilty” was a universal one – it appears not. If Mr Corcoran had not been proven guilty after due process of law, then we MUST presume he is innocent. Some comments seem to assume that he is guilty until proven innocent. In my opinion, the many violations of due process in this case (and the President’s partiality is just one of them) are indicative of attempts to secure a conviction by dubious means. Why not do things by the book if your case is sound? Whilst many comments may focus upon specifics, a common thread can be found, namely disbelief about the EPO’s apparent disregard for the rule of law. Therein lies the problem. It’s particularly bad for the EPO to become a lawless place because it’s all about patent law and if it cannot obey simple law (or even court orders), what does that say about this institution’s potential or capacity for justice? We’re not sure if this is true; did he really get suspended again? No source is mentioned and the punctuation looks bad enough to damage the poster’s credibility/intent. I thought that the principle of “innocent until proven guilty” was a universal one. SUEPO has just published this translation of the recent report in German. According to Mathieu Klos, who wrote it before the secretive meeting, Senya Okyay is Corcoran’s lawyer and he insists that “[t]he Administrative Council now no longer has no reason to draw the proceedings out any further” (translated from English to German and back to English, so there might be discrepancies). The judge of the Board of Appeals at the European Patent Office (EPO) suspended three years ago is to be reinstated, under a decision yesterday by the Administrative Tribunal at the International Labour Organisation in Geneva (ILOAT) (File Refs. 3958 and 3960). The supreme labour court for employees of international organisations also awarded the EPO judge, in two separate rulings, a total of some 40,000 Euro in compensatory payment for moral damages and compensation for loss of earnings. The decisions are likely to increase the pressure enormously on the Administrative Council of the Patent Office to bring the disciplinary proceedings to a close and to reinstate the judge. The judge had made recourse to the ILOAT due to his suspension and its extension imposed by the Council. “The ILOAT has ruled”, said the judge’s lawyer, Senya Okyay, “that Mr. Battistelli was biased in these proceedings, and has a conflict of interests. The tribunal accordingly decided in my client’s favour.” The ILOAT criticised the fact that EPO President Benoît Battistelli had featured in the internal Office disciplinary proceedings both as a party as well as an advisor to the disciplinary structure relating to EPO judges. There were accordingly doubts as to the impartiality of the President. The judgment also indirectly implied the accusation that the President and Administrative Council had not respected an adequate distribution of power with regard to the disciplinary proceedings. This accusation has been lurking in the background ever since the case first began in December 2014. At that time, Office supremo Battistelli imposed a ban on the judge entering the EPO, and pushed through his suspension by way of the Administrative Council. According to the EPO statutes, the Administrative Council is exclusively responsible for disciplinary matters relating to members of the Boards of Appeal. The reason for the suspension was the accusation of dissemination of unpublished information and critical expressions of opinion about the activity of the Boards of Appeal, as well as the beleaguered EPO Director Željko Topić. The judge was also accused of having uttered accusations and threats against the EPO and its staff. By way of evidence a USB stick belonging to the judge was confiscated. According to information provided to JUVE, this was found to contained, among other things, critical articles about Topić. These did not derive from the judge himself, however. Whether this is a contravention of EPO regulations has been a matter of dispute right to the bitter end. The case became incendiary because of the issue of the independence of the Boards of Appeal from the Office itself. Last year the Administrative Council undertook a further separation from the EPO Court. As well as that, the disputes surrounding the manner in which disciplinary matters are dealt with at the Office became more heated. Specifically, in formal terms an EPO judge can only be suspended by the Administrative Council if the Enlarged Board of Appeal recommends such a measure. Last year, however, the Court rejected this, after Battistelli intervened in writing in the ongoing proceedings. The Enlarged Board of Appeal regarded this as a massive exertion of influence, and ended the proceedings without a recommendation. Experts then regarded the Administrative Council as being under an obligation to reinstate the judge. This did not happen. Added to that, Topić and EPO President Battistelli took out private prosecutions against him before courts in Munich and Croatia. According to the EPO Statutes, these prevented a decision in the disciplinary matter if it had not yet been resolved. According to information provided to JUVE, however, these actions have in the interim been terminated, either because they were withdrawn or because the courts rejected them as unfounded. The Administrative Council will in all probability make a decision in the matter next week, when the representatives of the 38 EPO Member States will gather for their last meeting in Munich. The issue is already on the agenda. Some observers are of the view, however, that this may not necessarily be a decision based on facts of law, because the Administrative Council is, above all, a political body. During the weeks leading up to the ILOAT decision, there were rumours circulating at the EPO that the Administrative Council could reject a reinstatement, and instead put the judge back to work in his former position as a patent examiner. This would once again make Office boss Battistelli his direct superior. That would add fuel to the fire. The situation at the EPO is already very tense. Parts of the EPO staff, among them the main staff union SUEPO and a number of EPO judges are locked in a bitter dispute with Battistelli. This is why the new leader of the Administrative Council, Dr. Christoph Ernst, made it clear in a JUVE interview in November that the restoration of social peace in the Office is one of the primary goals of the supervisory body for the future. The Administrative Council is setting a great deal of hope in this situation on the EPO chief executive designate, Antónios Campinos, who will be taking over from Battistelli in July 2018.